Get ready for spectacularly responsive performance from the Intel NUC with 8th Generation Intel Core i7 processor. 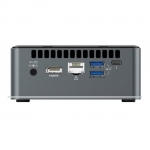 The latest generation Intel NUC kit lets you or your customers build the exact system they want. From choosing memory options to storage configurations, the benefit of building up an Intel NUC kit is the ability to completely customize the kit for a specific usage. Whether editing 4K video, casual gaming, or serious multitasking, the Intel Mini PC kit delivers the features people want—in a size that fits easily into any lifestyle and any room in the house. • The Intel Mini PC kit with a true quad-core 8th Generation Intel Core i7 processor delivers a big jump in performance compared to the previous generation Intel. Whether it’s built to create video content or mega task, the Intel Mini PC kit gives great visual immersion with Iris Plus graphics 655 and the unprecedented performance of Intel Core processors. 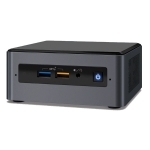 • The Intel Mini PC kit has a chassis that is a connectivity powerhouse. It comes with Thunderbolt 3 which supports up to 40 GBps of data transfer and four USB 3.1 ports to bolster productivity to move big media files around, as well as room enough for peripherals and then some. There’s also room in for an M.2 SSD, and the kit comes with two additional USB ports via 1x4 internal headers, an HDMI 2.0a port for 4K displays, and DisplayPort 1.2 via USB-C. With the ability to have triple displays in 4K, photos, videos, and streaming media are all picture perfect. • In a footprint that’s almost zero—especially when compared with a tower— this Intel NUC Mini PC kit can be custom built to have the performance and features of a desktop PC in a device that fits in the palm of your hand. The small size means the Intel NUC can be positioned anywhere—from behind a display to tucked discretely in an entertainment center. And with improved cooling, fan noise is minimal—so it doesn’t sound like there’s a PC in the living room if the Intel NUC Mini PC is used for gaming.